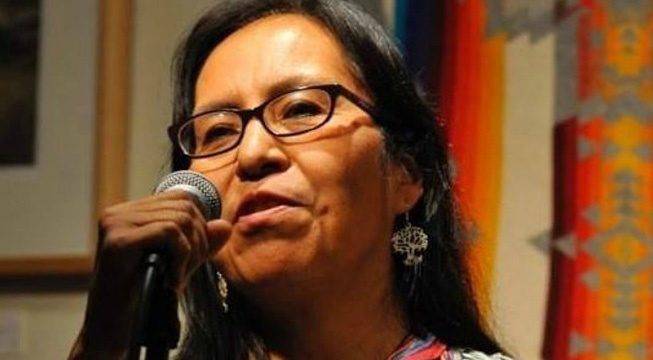 The following post is by Pachamama Alliance friend, advisor, and spiritual leader, Weyakpa Najin Win—Woman Stands Shining (Pat McCabe) of Diné (Navajo) Nation and Lakota spiritual lineage. She is guiding a Pachamama Journey in northern New Mexico near Taos in May, 2016 and invites you to experience the powerful land and sacred traditions that awakened, healed, and strengthened her to be the leader and wisdom keeper she is today. I am telling you my story because I want to give you the feel for this transformation. And that is how I see this Journey. What I want to offer to people is to bring them to a place of feeling themselves—well, feeling period. Who has time to feel in the modern world? So, first of all just to stop, and feel, to feel your own capacity to take care of the necessities of your life. This is really great medicine for myself also. It’s a great practice in gratitude for me to bring people to this home. The one who created us as human beings, we call her Changing Woman. She started out here in the Southwest but then she ended up marrying the Sun and he built her a white shell palace in the Pacific Northwest, so she ended up there, but she never forgot about where she came from. When she created the first human beings, the first four original clans, she told them that they needed to come back here, to this home. So within our own creation stories, we have a migration, which is slightly different than what anthropologists talk about, but we acknowledge a migration. My clan grandfather says that we’ve always been innovators. After the interruption of our culture, we had to adapt. My culture highly values adaptation and we use our original spiritual principles to help guide us in our adaptation. They help us to understand when we’re getting too far away from original instructions. Original instructions are basically the guidebook for how to be on this Mother Earth, the principles for being here. Sometimes that’s very hard to navigate in this modern world. Some people feel like they’ve lost track of any of that kind of guidance and they don’t feel it present in their lineage or their culture, they feel severed from that. I understand that and I feel like this is the place for indigenous people and indigenous culture today. To keep bringing forward what we still hold from that guidebook about how to be here, how to be on this Mother Earth. My grandparents were taken to Dutch Christian Missionary boarding schools and they were not allowed to practice our culture in any way, shape, or form—they were severely punished for doing that. By the time I came along they weren’t really talking about these original instructions or cultural guidelines to help us to stay on track. So I got launched out into the world with a very different perspective from many of my own people. Like many people in this time, what became the emphasis of life was to be well-educated, to have a career, and success was in part defined by my financial situation. So that is how I started out, along with many other people. I spent time at some very high learning institutions. My father went to Stanford University and I got sent to an East Coast boarding school, attending Phillips Exeter Academy, and I studied abroad in France. I did the things that a learned person would do. But at the same time I look like I look—clearly I am an indigenous person. Everywhere I went people would always remind me of that. They would say, “You’re Native American, what’s that all about?” And I didn’t have any way to respond that I felt confident about. I could never really get away from who I was even though I was trying to participate in this other culture. There was an unrest inside of me and at a certain point I felt like I didn’t belong in this modern world, I didn’t look right, and there was something going on inside of me that didn’t line up. At the same time, I didn’t have enough information or language to go back into my own people’s world. I felt kind of abandoned by both sides, but I was doing my best. I was going to university and I decided to go and get out in nature one summer. I came to Angel Fire, New Mexico—just over the hill from me now. I met some people, including my future husband, and they started showing me around this place that was only two-and-one-half hours from Albuquerque where I grew up and yet it was worlds away from that urban experience. I couldn’t quite put my finger on it, but just the way that they thought, they weren’t so concerned with status, or even education or any of those things. What really mattered was how you were relating to each other, your knowledge of where the water was, what kind of trees were around, and what kind of firewood might be available—it was a whole different system of thought. There was something about it that really appealed to me because it allowed everyone to participate, there was a universality about it. Something started to change inside of me. I went back to school and this man—my future husband—followed me back to Albuquerque. He tried to move to Albuquerque, but he couldn’t handle it, it was too weird for him. He eventually he talked me into to trying to live in the north of the state of New Mexico, so I did that. One of the first things he did was to bring me to the hot springs. We got up at dawn and went down to the Rio Grande River—which runs through Albuquerque too, but in all the time that I lived there, I never spent time at the river. I also never spent time in the Sandia Mountains behind the city, but I really wasn’t oriented that way. It was almost like they were invisible. 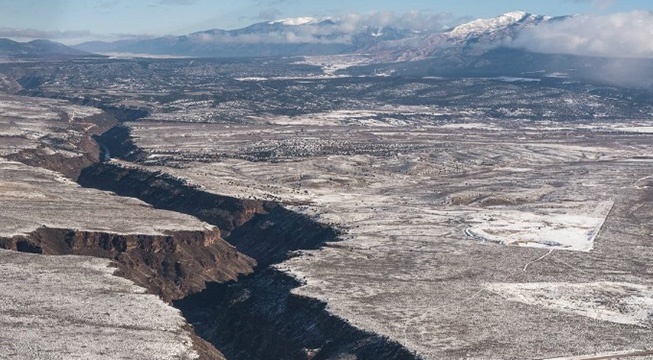 But, when he brought me up north, to Taos, early one morning we got up and went down to the gorge—we have this huge colorful mountain and mountain range and it drops down to this plateau and then this crack in the Earth opens up with the river at the bottom of that, it’s very dramatic. He was opening my eyes to the fact that this Mother Earth is so powerful. Rio Grande Gorge, Taos, New Mexico. Photo by Andrew Gordon. I had never really been in natural water like that. He played an eagle bone whistle for me and he called over a pair of eagles to us. I had no idea that such a thing was possible. I agreed to come and stay with him there and I left school. It felt like a huge risk to hop off of that track that I was on - and I was a really good student, I was going places, I was going to be a somebody! All of a sudden I hopped off of that track and here I went out into these mountains in the north. I started meeting people, and all of these lay midwives. Indian Health Services is a government sponsored health program for Native people and when they came, we lost much of our midwifing knowledge—everyone started having hospital births because it was free (so to speak) and they convinced us that it would be safer and sanitary—the same way that they convince most women now. I started hanging out with these women who were delivering babies in the hot springs, the sagebrush, and in tipis. I was amazed. Here I was a native person and I never heard my mother, my auntie, or my grandmother talk about that. I found out later that my grandmother was a midwife, but she never talked about it with me. I started getting in touch with a reality that wasn’t so governed by institutions. I also got introduced to what they say is a hundreds, if not thousands, of years old method of growing food, the acequia system. This is an irrigation system where you channel water coming down off of the mountains and channel it to different farming fields. Where we lived, our headwaters, was another hot spring. We would have to tend to that ditch all the way from the source of where the water came out of the ground down the mountain to this little field. I had never even grown my own food and I was so excited to have my first garden! In this culture, neighbors get together, they call it parciantes. They all have a responsibility to make sure that this water is going to flow down from the source and make it to their field and then they have to make sure that it’s clear enough to get through their field and go on to the next field. That next person has to make sure it can go on to the next, so we’re all very interdependent with this water. What I want to bring to this Journey is a sense of interdependence—another thing that modern culture has stamped out of us in many ways. I call it, “The Island Life.” How we’re all living on our own little island. We go into our little house and we’re expected to take care of every single thing—there’s no village to raise your child—no, you’re going to do it by yourself. You go outside and you see your neighbors across the way, maybe you give them a wave and they say, “How’s it going?” and you say, “I’m fine!” and then you both go back in and sweat out your mortgage, alone. Now it’s been twenty-nine years and I don’t have any interest in doing that. We might call this a “decolonizing journey.” To be decolonized to me is to unplug, to take that risk of unplugging from what is promised to be a surefire thing for us. It used to be that you’d go to college and you’d be set. You’re going to have a job. Well, eventually that broke down and now we’re like, “Not necessarily, and in fact, you could come out very enslaved to a system that you don’t agree with but you don’t have a choice.” These systems that may have been able to start out with some kind of true idea of helping and supporting us, almost all of them now have turned to profit-making as their primary goal. Even ten or fifteen years ago I would have said the reason to come on this Journey would be just to feel yourself as a natural human being again, but today I would say it’s even much more urgent than that. Eventually these systems are going to fall. They can’t keep growing the way that they’re growing and so many of them are kind of on the brink of that already. We can wait for that fall or we can be proactive. I take that a little bit from the Achuar people as I learned it from Pachamama Alliance—they didn’t wait for the monster to come to them, they decided to go out and meet it. This is a slightly happier scenario in that being proactive will bring us back into a relationship—an actual relationship—with the land. This is how many people still live here. We’re one of the poorest counties in one of the poorest states in the nation and yet, we have a thriving life community. That has everything to do with our sense of community, our relationship with each other, our relationship with this Earth, to the water and the animals, and also to the spirit of this place. Many people talk about Taos mountain and we say, “The mountain will either receive you or it will reject you.” To be received here—and I feel like I have been received here in such a beautiful way—is an invitation to come back into a deeper connection with our original design for a thriving life. I was always going to be trying to mold myself to fit into a generic machine. That’s what that other way was kind of asking of me and out here I am allowed to be and to discover and to develop this very special gifting that I am to this life and to this Mother Earth. I would say that many people in Taos have found that here. It’s a place of discovery and allowing unlike anywhere I’ve been—and I’ve traveled all over the world—I’m always happy to come back here. What I want to do is bring people to places that human beings have visited for millennia. Mountains, valleys, water—especially water—I am such a water woman. I want to give a lot of teaching about how profound the water is. The water is really important. Water travels and has the ability to travel. Water has the ability to amplify our prayers and intentions. When we pray into the waters they travel and I always think about them traveling down to the Achuar through the clouds, through the underground rivers. Every time we pray into the water and those Andes mountains and the Amazon river too, they say, “Hey, our granddaughter is praying right now and that’s good!” and I like to acknowledge our lineage with the water—that all of our ancestors have had a drink of this same glass of water I have right here. The mountains are a big part of our life here, so I’d want to bring people up to the places in the mountains that I know. What I am offering to people is an opportunity to hear my process for engaging this Mother Earth. For having a real, live, profound relationship with her. I want to bring the people to those places where that happened. There is something very powerful in this particular spot on the Earth. People from all over the world know it and they come here. I want to give people the opportunity to really feel and to be able to open as much as they are ready to, to that risk of transformation from being some kind of generic human and being able to listen to and see the reflection of themselves in this Mother Earth. Because if I could show them a glimpse of that, nothing will ever be the same for them. It’s an incredibly mysterious, magical, and interconnected world, but you have to have the eyes to see it. Sometimes it takes going someplace out of your element in order for that opening and awakening to occur.